sales, software, management, network, collaboration, groupware, teamware, sales management, sales tracking, sales scheduling, sales project, sales rganizer, ProjectManager, DocumentManager. Allows your team to plan, track and report of your sales team's activities, share your contacts, calendar etc. VIP Task Manager is a professional tool for sales team project, workflow management. VIP Task Manager combines functions of CRM, Team Organizer, Project Manager, Document Manager. It allows your team to plan, track and report your sales team's activities, share your contacts, calendar, documents etc., send messages to your customers and colleagues, receive notifications, take actions and get reports.Why to use VIP Task Manager? Managing sales is easy until you sell a few products to a few customers. As soon as your sales management process becomes more complicated, managing sales becomes a challenging task. The number of sales tasks grows as well as grows the number of managers, customers, regions and products, and you need to control all these aspects. You need to develop a comprehensive sales strategy, transform it into detailed action plan with measurable performance metrics, track execution and get measure results. It is almost impossible without a special system for planning, tracking, analyzing, reporting, and controlling all aspects of sales activity, projects and tasks. VIP Task Manager is the best software system for managing your sales team's workflow, including sales planning, tracking and reporting. The system provides clear vision of what salespersons did yesterday, what they are doing now and what they will do tomorrow. VIP Task Manager helps you to develop comprehensive, prioritized sales plans, track their completion and create real-time reports. Using VIP Task Manager leads to better understanding of sales tasks and how they rely on sales strategy, their priorities and status, ways of sales growth and sources of motivation from achieved results. 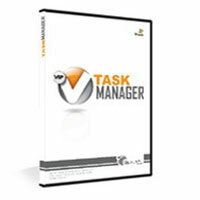 VIP task Manager is easy-to-use software and doesn't require advanced user or system administrator skills. Using VIP Task Manager you can collaborate with your sales team members accross the world (via LAN or Internet). See a Live Demo, get a Free Hosted Trial or Download VIP Task Manager for free.